I’m reading Little Women with an online group, and in my excitement I went to dig out my copy only to discover — gasp — that I couldn’t find it. I started first searching the bookshelves in my and Barry’s bedroom. I was sure I knew just where that book was. Nope. The more I searched, the more frantic I became. Finally I gave up and asked Barry if he minded if I bought another copy. So I did. Unfortunately, they shipped me a different edition than I ordered. Then they apologized and said they do not have the one I wanted, but they let me keep the one they sent and refunded my money, so I was satisfied, mostly, although I had hoped that the one I ordered would have extra essays and such in it. This one does have a nice introduction, but that’s it. I can’t say how old I was when I first read it, but I was probably eight or so. The book captivated me! I read it more than once. While I didn’t have any Barbies as a child, somehow I did have a fashion doll of some sort with dark hair. I decided she was Jo. Because I was so worried that my father, as hers had, would be called away to war (not that a war was going on at the time that I was aware of as a child, but still) I had her sacrifice her hair just as she does in the book. Yes, I cut into a sweet bob and was quite happy with it. I also made her a gray poncho out of a scrap of fabric and had her become the last woman in the world because a nuclear war had occurred. The poor young woman was left to take care of all of the children orphaned by the war on her own, which she did admirably (in Little Men and under the pine trees where I took “her” to tend her family), although I had no Professor Bhaer to give her. Perhaps the deepest print she left on me was her struggle to turn from writing “garbage” fiction for money versus writing from a deeper place: she wrote sensationalistic stories to send her dear, dying sister to the seashore. Who couldn’t understand that? And yet when Professor Bhaer gently redirects her, she quickly repents and vows to write only things that are worthy of her. I’m pretty much a “live and let live” kind of person who truly believes we need to make our own choices, but I am with Professor Bhaer on this one. While perhaps his objections came from a place of moral concern for what she was writing, I do agree that we should only write those things that come from our souls. We should attempt to ignore what others expect or want us to write and create as if we never need a reader, an editor, or a publisher. There’s time to consider whether or not something needs tweaking later…craft is a different issue. But first write from your deepest depths. Ah, yes, Jo does seem to be a strong contender for favorite, Danni, doesn’t she? What shocks me most about this novel was being reminded that Alcott didn’t really want to write this but was persuaded to. I don’t suppose I really care, but I was a bit disappointed. 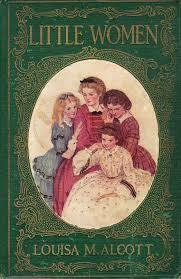 Still, what a gorgeous rendering of girlhood at the time. She wrote both before her time and of her time — not an easy feat.